HALLIE EPHRON: There was a wonderful piece in the New York Times last week about chicken skin. There are, the writer observed, white-meat people and dark-meat people. And then there are people (like me) whose dream is to roast a chicken and then rip off and devour its crisp skin before the bird makes it to the table. My mother-in-law would have been aghast. Health conscious, she always skinned the chicken before she cooked it. My grandmother was the opposite. 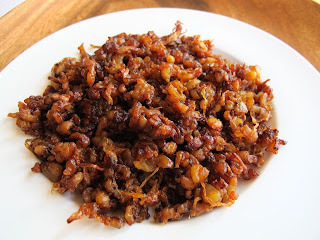 She saved bits of chicken fat and skin trimmed from the bird and cooked it up in a frying pan, rendering all the fat (schmaltz) until all that was left were crispy bits (gribenes) like chicken-skin potato chips. Mmmm. I also love the green stuff (tomalley) in lobsters which I gather is the lobster's liver and pancreas and which the rest of my family proclaims "gross." Fortunately they let me harvest if from their lobster bodies. Love the fatty tail of a broiled lamb chop. Potato skin. Aspic. Blood sausage. Head cheese. Raw green beans and fresh cilantro. I do draw the line. Fish eyes, uh uh. What about you? Do you have a passion for tastes that others would prefer to pass up? Where do you draw the line? ROSEMARY HARRIS: Almost everything you mentioned grosses me out. I need a glass of wine before I can even touch a piece of raw chicken. (Raw turkey requires two glasses.) Don't think I'm that good at batting clean up for someone else's dinner - oh wait...potato skins. Love 'em...they're the best part and my husband always leaves them. HANK PHILLIPPI RYAN: (You're so funny, Hallie...) Tomalley? No. Oh, no. I've even used my cloth napkin to wipe the last disgusting (sorry) traces from the otherwise-delicious lobster. However: Of, course, potato skins. 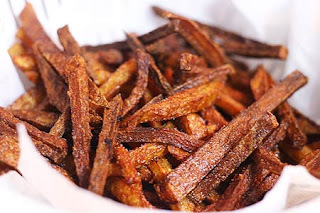 Plus, I love the crispy really-burned french fries. Raw green beans, wonderful. Cold pizza, yum. HALLIE: Am I the only one that thought Hank was referring to day old LATKES? Nevertheless, I see a pattern. Crispy. Fatty. Salty. RHYS BOWEN: I'm feeling a little queasy. Only a couple of items I confess to eating--raw cilantro and parsley when I'm cooking. Skins on baked potatoes. And very crispy chicken skin (although I don't eat it any longer). I've even lost my taste for those traditionally gross English things like kidneys since my children took biology and described in detail what those kidneys had been doing. But I do like sweetbreads, if I don't have to cook them myself. When I was a kid, living in a very cold house, I used to love toast and dripping--you know, the pan drippings from a beef or lamb roasts. I once ate brains. It was delicious until I knew what it was! 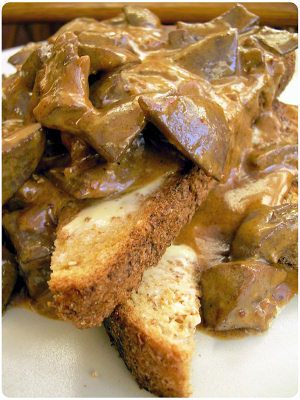 HALLIE: Laughing, Rhys - I remember when I saw "cervelles" on a french menu and ordered it because I thought it was veal. JAN BROGAN: I was one of those kids wh o wouldn't eat the peas on the plate if they touched the mashed potatoes -- and I loved both of them separately, so you can see what you're dealing with. But I do love chicken and turkey skin, crispy. Burnt cheese is actually superior to the moderately melted, and I used to prefer soggy salad, like Hank, but not anymore. Mostly, if it grosses anyone out -- it grosses me out first. LUCY BURDETTE: I saw that same article Hallie, and did not clip out the recipe for chicken skin tacos! For someone who's writing about a food critic, I have pretty picky tastes. Not big on fishy fish (like the sardines Hallie adores), or entrails of any kind, or raw fish or meat. Nothing with obvious suckers either:). In fact the more I read about the life of a food critic, the more grateful I don't actually have the job! JULIA SPENCER-FLEMING: I've found that my lack of enthusiasm for certain --I'm trying to think of a word that describes the foods that Hallie is talking about here. Edgy cuisine? Acquired taste comestibles?-- certain foodstuffs is balanced by others' love of the same. So I don't eat roasted chicken skin, but my son loves it. When we have lobster, Ross gets my tomallay. 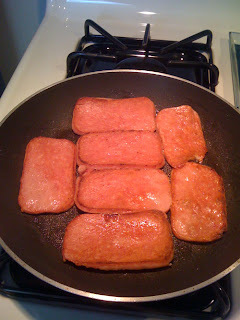 On the other hand, I have a weird enthusiasm for fried Spam (TM) that no one else shares. Also? Peanut butter and pickles. No, not just when I'm pregnant. Reading culinary history, I've come to realize how many of these now out-of-favor, odd-bits-of-the-animal dishes our ancestors ate because of their frugality. They couldn't afford to throw away any calories. Did you know in New England in the 18th and 19th century fishing families ate cod cheeks? Cod cheeks! Try serving that at the next Crime Bake. HALLIE: Ahem. My husband eats the cheeks of any fish that's on the table. They're delicious. And a delicacy! (Those old timers used to eat oysters and lobsters, too, because they were so plentiful and not considered "real food" by the wealthy.) Cod cheeks taste like lobster-y scallops. And cod has the virtue of being large so it's got sizeable cheeks. And may I say: Fried Spam, ICK! DEBORAH CROMBIE: I'm in the chicken skin camp and my DH is in the other--he won't eat it even when it has all the seasoning in it. Better for him, I suppose, but I think he's missing out. I like all sorts of weird things, and have no objection to tentacles, or fish with the eyes still in. It was a big treat for me when I was a little girl to eat the chicken heart. And I love sweetbreads. My mother fixed them regularly. Don't know about the lobster goop, however, as in Texas lobster doesn't figure on our menu very often. So what about you all, gentle eaters? Are there foods you relish that others eschew? Reading this post I was both enticed (potato skins) and repulsed (chicken skin). I will not eat any fatty animal bits and meticulously trim every chop, steak or roast that I eat. And since I'm the main cook in the house, the meat is usually well-trimmed before it's cooked, much to hubby's dismay. Sometimes I can't watch when he eats *shudder*. Julia, not only the cod cheeks, but also the tongues! Growing up in NS, cheeks-and-tongues were a regular item on the menu. Lu-Grace - laughing here because one of the reasons I love to cook is because then I get to be in charge of what we eat, too. Cod tongues? Really. Anyone eaten them? Potato skins I can handle. Other than that...all the things you mentioned - eewwww!! Also love crispy chicken and turkey skin, but the best is roasted duck skin. Love this post. Foods go in fads, remember when "soul" food was all the rage? Southerns of all species were wrinkling their brows wondering what was so special about things we eat every day. A couple of years ago I attended a lecture given by a woman who writes book reviews for the Lexington, KY paper. She was expounding on antique southern cookbooks with her nose in the air. She started in on oysters. Mentioned how terrible people were to use them as thicking in soups. I'm muttering under my breath "bull..." with my husband whispering "don't you dare." Mid-19th century oysters were food for the poor, Dickens mentions them in one of his books. I'm impressed with how adventurous you all are. I've been a picky meat/animal eater since I was a child, and now that I don't have to eat what someone else put on my plate, I won't. I am completely grossed out by eating meat from bones. I will cut away a half-inch of meat to get rid of that fatty bit. And sweetbreads, cheeks, skin? Forget it. On the other hand, I'll eat absolutely any part of anything vegetable or fruit or grain (yay for potato skins), which almost makes my husband (who eats most of the stuff above that I won't touch) sick, because he can't stand mushy foods. He's never eaten a banana in his life and watermelon (the once he tried it) made him throw up. We each think the other is pretty weird in food tastes. I grew up in a household where brains and eggs was a breakfast staple, tongue and avocado sandwiches was served for Sunday afternoon late lunch, and my dad ate pickled pigs feet. Me? Not so much those things. *shudder* However, I still love liver and onions, Rocky Mountain oysters (the dangly bits taken from a male calf, breaded and deep fried, aka calf fries) and I'd cook and eat sweetbreads if I could find them in the store! Pate? (goose liver) Escargot? (snails) And caviar (fish eggs)? Where do I get in line? Octopus and calimari not so much. Smoked oysters not fresh. Potato skins? Too bad they aren't on the diet. :( Lobster tail only--I'm too impatient to deal with a whole lobster. Love reading this! We used to eat tongue sanwiches from the deli when I was a kid--I must say, even thinking about that texture now makes me want a day-old latte. Or a day old latke, Hallie, which I bet would be great with sour cream. Chopped liver, yes, mos def. Sweetbreaads, sorry. The little tabs of fat in te ends of rack of lamb? Oh, yes--in fact, grilling rack of lamb this very night! One thing most people eschew that I've eaten since a kid: raw onion. Just that, folks. Nibbling on it, tearing up a little, drinking water. Strange but true! On eating raw cookie dough - I ate so much raw chocolate chip cookie dough when I was teenager that it ruined chocolate chip cookies for me forever. I get nauseous just looking at one. 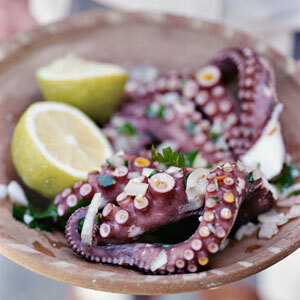 Silver, I forgot about octopus and calimari - Maybe, I'm not so picky after all. I actually like that tough, leathery texture. What a great post! I hate picky eaters--have some in my family. In fact my daughter turned down leftover creamed tuna for lunch today. I often embarrass friends by eating a tongue sandwich at the deli, love chopped liver, and would cook kidneys with bacon if I could find them--at my store, you have to order a case. And I'll fight anyone for the chicken or turkey skin. Sigh. Those things are all so bad for you. Tammy -- someone else who can't eat meat off the bone! I blame the story of St. Blaise saving the boy with the fish bones stuck in his throat. Happily ate braunschwauger sandwiches as a kid until I found out they were liverwirst. :) But my husband decided I was no longer a picky eater when I ate street tacos in Mexico on my birthday (it was all we could find in a little beach town mid week) and languoustine in France! Apparently black cod collars are really good and taste like the fish itself. I'll have to work up to them! I'm still chuckling about "eschew." Hallie is SO funny. Lisa, thank goodness for oatmeal, right? What memories this post brings up! When we were living in Columbus, OH and dirt poor, I can remember buying tongue (cow) which was dirt cheap, roasting it and serving it with a mustard sauce. Also Spam cooked a la ham with a brown sugar and mustard sauce and cloves stuck in the X where the scores crossed. Love excargots, sushi (including Uni), chicken and potato skins, fat from lamb and pork chops. Have loved soggy salad since I was a kid, sort of like stew - always better the second day. Raw onion? 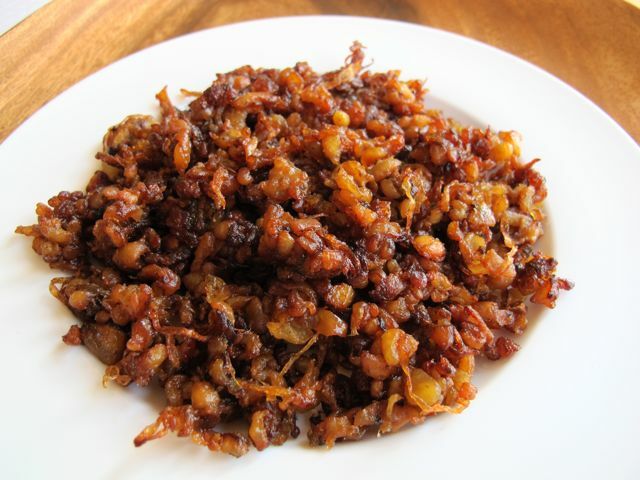 I know people say they can eat those sweet vidalia onions like apples... never tried but now I will. Mmmm, street tacos in Mexico - I bet they were fabulous. We ate them in a little dive in a strip mall near the Salton sea - Best Ever! Had to laugh - Leslie-the-picky-eater won't eat meat with a bone on it discovers LIVERWURST?! When I was 2 weeks overdue going into labor and my husband had eaten all the 'going to the hospital' sandwiches, I went into labor at 2 AM and the only thing in the house to make into sandwiches was liverwurst and English muffins. He ate those sandwiches for 12 hours... and hasn't touched them since. 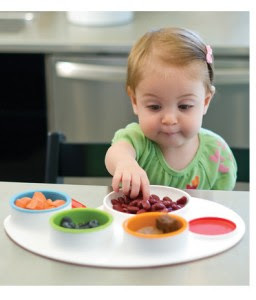 Brian, I so agree: "we waste much when we can be creative with our leavings to make additional meals"
Oh, Hallie, I am sooo jealous. I don't remember the last time I had a crispy lamb chop tail. They don't sell them that way here for some reason. I love escargo. Eat vension and buffalo which drives Hubby crazy. I'm with you, Hank, on that lobster stuff. Clean it all out. One of the things I miss from childhood is steak tartar. Wouldn't dream of eating it today. I actually like many of these. 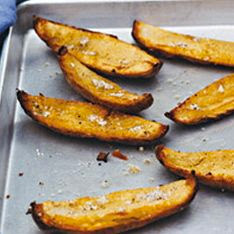 Potato skins are my personal favorite and such a weakness of mine. mmm! Who would skip on potato skins! They are absolutely amazing. It's funny how diverse people's tastes could be, though!